I'm sitting here planning out my garden plot, and decided to come check out what my fellow LTHers were doing in their gardens this year. But no 2015 thread yet! So here it is... what's going on in YOUR garden? My mother informed me that there was enough rhubarb this morning to pick, cook with some strawberries to cut the tartness, and eat warm over a few scoops of vanilla ice cream. Not much yet, but I have twenty-seven chile starts (nine Thai, eighteen Japanese Santaka), plus sixteen (!) Mortgage Lifter tomato seedlings. I moved back to Evanston in November, and have a LOT more room to both start seeds and raise them properly, and so am taking full advantage of the opportunity. I'll be direct-sowing an heirloom kale next weekend and a white-skinned cucumber variety about the time I put the tomatoes and chiles in. It's going to be great to have room for a big separate veg garden, as opposed to the perennial garden that I started last fall and augmented last weekend (though the perennial herbs will be going in that one). Bulletins/pix as events warrant. Happy gardening, people! mamagotcha wrote: I sent some to Freezer Pig, and am hoping that Glass Gem corn will make a cameo once in a while in his excellent farm stories! Squeezing milk out of cows has taken up a lot of free time this winter, but I've enjoyed every second of it. 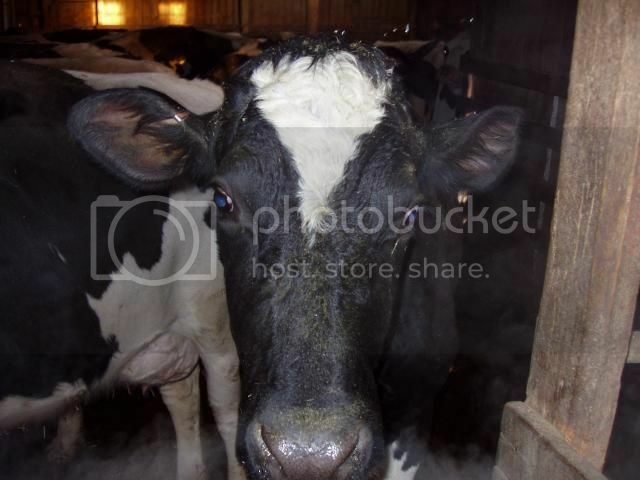 Denise goes along often and is learning the process of coaxing milk out of cows. I can't explain it, but it's enjoyable work for me, and as it turns out, my better half. Pigs are coming in a couple weeks, new chicks will be here in about a month. We'll start planting the garden as soon as it drys off now. We've had a couple of meals of asparagus and Denise said she's seen some new dandilions growing, so it's about time for a meal of greens. Even though this week has cooled down, it looks like Spring has sprung. PS ~ Thanks to everyone for all the PM's asking how things were going this winter. Freezer Pig, I am so tickled! And very cool about the cows. I spent several summers handmilking goats for larger herds, as well as my own small herd, and I found that there was something very zen and peaceful about it. 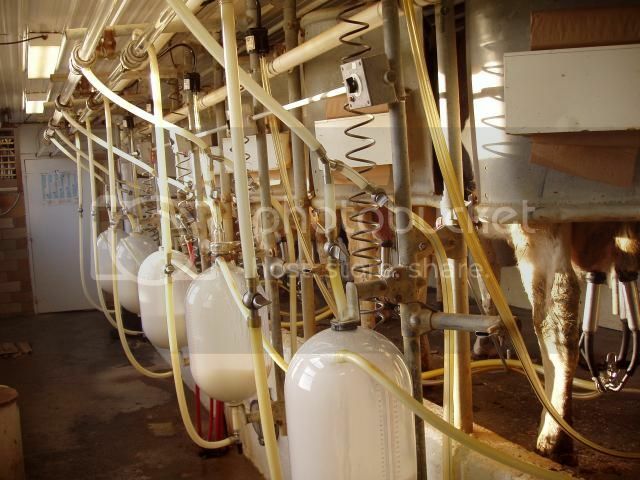 You just can't get milk from an upset animal, and so the atmosphere around the task is purposefully pleasant. I miss it. I've got space in a local community garden, and we've been spending the last few weekends gearing up for the new growing season. We moved seven raised beds from a defunct garden to our public parkway, and I'm planning to fill them with things that passerby can sample and enjoy: yellow, orange, and red cherry and pear tomatoes, basil, sunflowers with those tiny round Mexican cucumbers climbing them, kale and marigolds, Silverbeet five-color chard, potatoes, an herb box, and a pollinators' flower box. My own garden plot has a few returning herbs (I just salvaged a comfrey plant from one of our empty plots!) and flowers, and I've started a bunch of heirloom tomato seedlings in eggshells. As soon as I empty a few more eggs, I'll start some other things: zucchini and pattypan squash, merlot and jalapeno and serrano and sweet bell peppers, Scotch blue curled kale. I think I will grow more of the Glass Gem corn this year, along with the squash and a few pole beans, aka a Three Sisters planting. We put a new beehive in a few days ago, but I'm not sure they survived the freeze. Alas, my hearty sage plant shows no signs of life. I think I hacked it to death getting the sage last winter. Elfin wrote: Alas, my hearty sage plant shows no signs of life. I think I hacked it to death getting the sage last winter. Don't give up quite yet. Ours is slowly showing signs of recovery. It may return to its previous glory by the end of this warm (?) week. If cuttings are possible you would certainly be welcome to some--we've been trying to reduce its size for years. It's still early but chives have come back quite strongly. We also see oregano/marjoram and what I think is tarragon. Too bad there's no sign of rosemary overwintering and very little evidence of new lettuce in the cold frame. It looks like my sage survived, just barely. Oregano is unkillable, chives also doing well. I have some volunteer lettuce (I think, it could be Gai Lan from where it is, but the seedlings are too light-colored). I put in lettuce, snap pea, lacinato kale and harvested Gai Lan seeds (hoping they're viable, most of the pods didn't produce seeds), and covered the rest of the garden in plastic for insertion of future plants. I have sage and chives showing. I have done nothing else. Will have to buy tenders unless anyone here has some interesting spare tomatoes, eggplant, and pepper seedlings that they can't use. I will also be out of town for Kilbourn, Peterson, and Cheney plant sales. FreezerPig's tips on my asparagus really came through. I have beautiful spears ready to pick tomorrow. Thanks Freezer Pig! I was going to put the Mortgage Lifters in tomorrow, but the weather looks iffy at best and the ground is sodden, so they will have to wait until next week. They are now nearly a foot tall, and very robust, so they might just march downstairs and plant themselves. I'll just follow up with the tomato cages. I was going to haul the Kaffir lime tree down, too, but looking at the overnight temps forecast for this week, I think he'll be happier indoors for a while. Half of the Thai and Santaka chiles went in last Sunday, and seem no worse for the rain; I picked up one Poblano and one Habanero today, so that will do for the chile part of the garden (of course, I say that every year. . .). I sowed Lacinato kale last Sunday, too, and it's up already - as are two peony shoots, right in the middle of the veg garden. Kind of a fun surprise, and as this house was built in the '20s, they may have been here for a very long time. and seven or eight marigolds. My fish pepper seeds all crapped out, every single blessed one of them. Not one single sprout! But the supplier not only offered to send more, when he found out it was for a public harvest box in a community garden, he refunded the original order. And I still have some Glass Gem seeds, if anyone wants me to send some in the mail! First harvest of the season: thinning out the volunteer lettuce, plus some chives, for salad tonight. JoelF wrote: First harvest of the season: thinning out the volunteer lettuce, plus some chives, for salad tonight. I waiting a day or so for the chives, as they are about to flower. Are yours close? Big fat chive buds, no flowers yet. I ate a bud, but not as sharp-tasting as the flowers usually are. I made it amongst the 1st shoppers for the first day of Peterson Garden Project's sale. I also stood in line, like a 20th century groupie, waiting for almost an hour at Kilbourn for the 1st day of their plant sale to open. I only regret that I can't put these lovely seedlings in the ground due to the cold. I do have a cold frame but i is going to take some time in the old, insert tab A in slot B style to put it together. Watching the forecast the plants come in before sunset tomorrow. Anticipated overnight lows are in the 40's three days straight. pairs4life wrote: I made it amongst the 1st shoppers for the first day of Peterson Garden Project's sale. I also stood in line, like a 20th century groupie, waiting for almost an hour at Kilbourn for the 1st day of their plant sale to open. Was it an hour on Friday as well? I got to Kilbourn 30 minutes after it opened on Saturday (after stopping at Peterson first) and I waited a good hour. I've gone for the last couple of years and for some reason never remembered any wait remotely this long. Maybe I went on a Sunday. I didn't realize it was too cold to put seedlings in the ground. Already planted mine herbs, 3 types of lettuce, 2 kales, and a chad. We'll see how it goes. Funny. I landed 45 minutes early at Kilbourn so I was in the first group. I thought it started at 9 and it started at 10 am. It worked. Talked to a woman and her SIL. The woman recognized me from standing in line with me on Friday at Peterson Garden Project. Greens will be fine in the ground now. I purchased primarily tenders, eggplant, peppers, and tomatoes. They don't like it much once you hit mid-60's, hence my desire to wait before planting them. I'm not a Master Gardener but I've never had a problem with tomatoes or anything else due to overnight lows in the mid 40s, so long as it's reasonably dry. Fact is, we're in Chicago--it could dip like that in July. My preference is to take advantage of the few perfect days between now and then to get everything settled in. Chives, mint, sage, oregano, and thyme wintered over fine. Cilantro/coriander self-seeded like crazy. After years of trying everything, we now grow only tomatoes and herbs. We'll add lots of basil, thai basil, and flat parsley. Then 20 tomato plants-18 varieties, inc. green zebra. Same here, tomatoes & herbs, 12' x 8' garden in full sun. Gonna plant next week, but already have chive, garlic, thyme coming up by itself. Also will have basil, cilantro, dill, parsley, oregano. When those are going, I'll take a snippet of all of them for my salad. Makes for a very interesting mix! Will have some heirlooms that a friend did from seed, but they ain't the hardiest. Depending on the type of season, only the Mr. Stripey has worked well in the past. Then I'll do 4-6 'normal' varieties, and one cherry tom plant. Have used cages in the past, but now I stake & tie, stake & tie as they grow. Sometimes critters and deer have laid waste to my work, and for awhile I planted marigolds or onion sets on the perimeter, but this year I say screw it--let nature take its course. We've discovered some borage which I now remember picking up as a 'can't kill' donation from a nearby neighbor. It's doing pretty well. I've never dealt with it before. Does anyone have any ideas/suggestions for culinary use? How is it going to deal with the coming heat and humidity? Lots of greens and herbs this year...a lot of lettuce re-seeded itself, arugula looks gorgeous, chives in full flower, garlic chive pot looks like cousin It. Found a Thai Green Eggplant seedling at Gethsemane--it's already about doubled in size. And the strawberries are delicious! Finally, year 2 of the great corn experiment--now a WALL (bye bye pizza people) of corn and potatoes. Wow, boudreaulicious, it all looks fantastic! Can't wait to see the Corn Wall in progress. Are you doing sweet corn, or sticking with the Glass Gem? Half are planted with your Glass Gem and the other with another multi-colored sweet corn--Painted something or other. Definitely hoping the bags work since it gives me the flexibility to move them to four rows of four once they're ready to start pollination. For now, I'm keeping them all along the back row with a full row of potatoes in front of them. Last edited by boudreaulicious on May 29th, 2015, 7:06 am, edited 2 times in total. I have rogue lettuce ready to be picked.